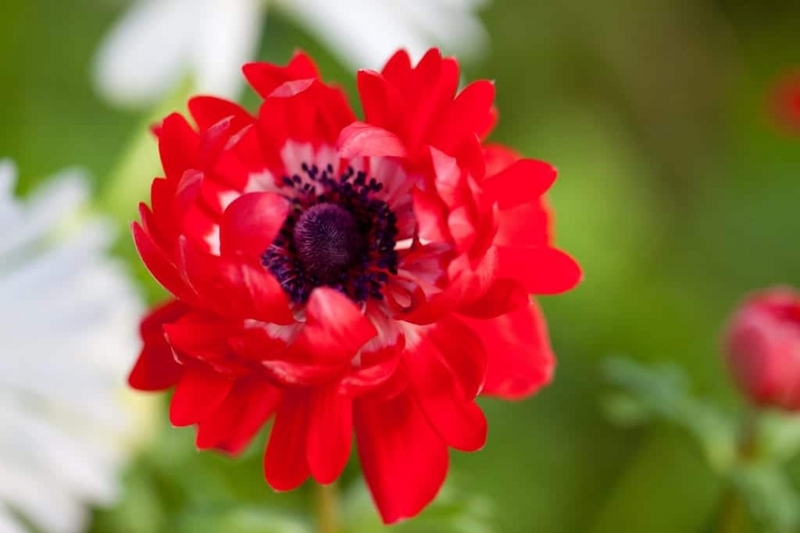 Anemone (Anemone coronaria): growing, planting, caring. This description is for spring-and summer-flowering species from hot dry areas. This image shows A. coronaria. This description concerns Anemone coronaria (with cultivars), as well as A. biflora, A. blanda, A. bucharica, A. eranthoides, A. x fulgens, A. heldreichiana, A. pavonina, A. petiolusa, A. tshaernjaewii and their cultivars. Anemones are flowering plants of the Renonculaceae family of temperate zones of both hemispheres. The word comes from the Greek and means "daughter of the wind", because the wind carries its feathery seeds at great distances! The florists' anemones are perennials erect tuberous, trifoliolate leaves 5 to 12 cm long. In spring, they flower and give single flowers with 5 to 8 red, blue or white tepals. The anemones of the florists of the group Sainte Brigitte are with double flowers, whereas those of the group of Caen are with simple flowers. Some cultivars do not belong to either of these two groups. Plant the anemones of the groups Caen and Sainte Brigitte in the spring, and the others in autumn, in a dry soil quickly prepared (unpacked with a pitchfork, then scratched to break the clods), between 5 and 8 cm deep. Pour half a watering can per plant. Water without unnecessarily wetting foliage in the morning or evening. Pour until satiety (the water takes some time to be absorbed by the soil). Sow under cold frame after rubbing mature seeds with dry sand to remove hairs. If your winters are too harsh, and mulching is not enough, winter your tubers in frost-free sand. If you have wintered your tubers, put them back in the spring.